This is review No. 10 of 16 in the first round of our competition. Each review will compare four burritos, with my favorite advancing to Round 2. In this exploration of the Burrito Bracket’s sprawling Northeast region, I eat my way to New York, once a burrito wasteland, and find that a lot has changed. 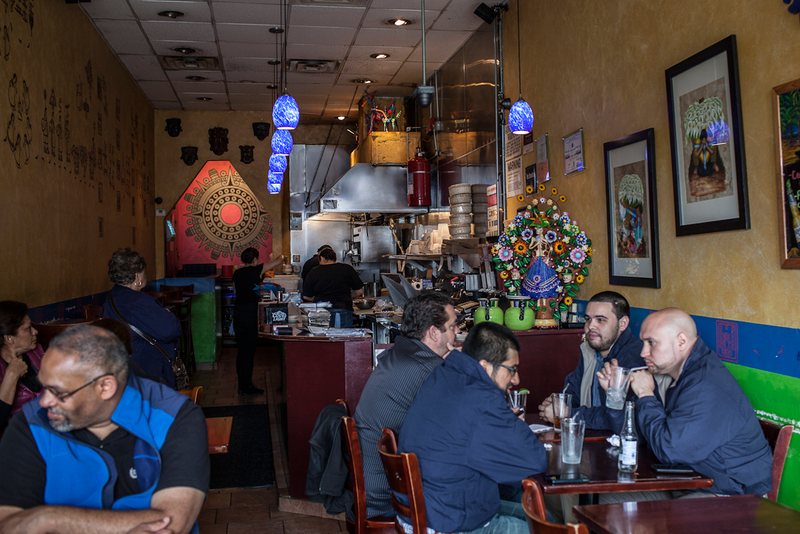 L’Patron Tacos is the baby of Ernesto Gonzalez, an alum of Rick Bayless’s Topolobampo and Kendall College’s Culinary Arts program, and his brothers. The restaurant’s humble building in Logan Square has been enlivened by walls painted electric green and orange, and a logo on the front is surprisingly similar to that of the tequila by the same name. It’s a lone family-run locale on a busy corner of Diversey Street, next to a Walgreens and across from an IHOP and a Popeyes. Inside is a two-room affair, bright and sparkling clean. The room on the left houses the order counter and kitchen; on the right is a scattering of tables and a shiny metal counter running under the windows. I visited at 11 a.m. on a Saturday, one of few patrons when I entered, but the place quickly filled up around me. Ranchera music pumped so loudly out of the speakers that I couldn’t hear the conversation at the table next to mine. I ordered a carne asada burrito. Thick, charred lines ran diagonally across the tortilla, making clear that the burrito had spent time under a griddle iron. The carne asada was grilled to a deep molasses color outside, while maintaining a slightly pink inside. The refried beans were classic, rustic and simple. There were too many folds of tortilla, but the sour cream was velvety and the lettuce, not standard-issue iceberg, was green and crunchy. The salsa was incredible, and a date written on the bottle let me know it was made just the day before. A squeeze bottle of red and another of green were placed on my tray, the clear plastic revealing chile seeds and chunky, pureed bits of flesh. 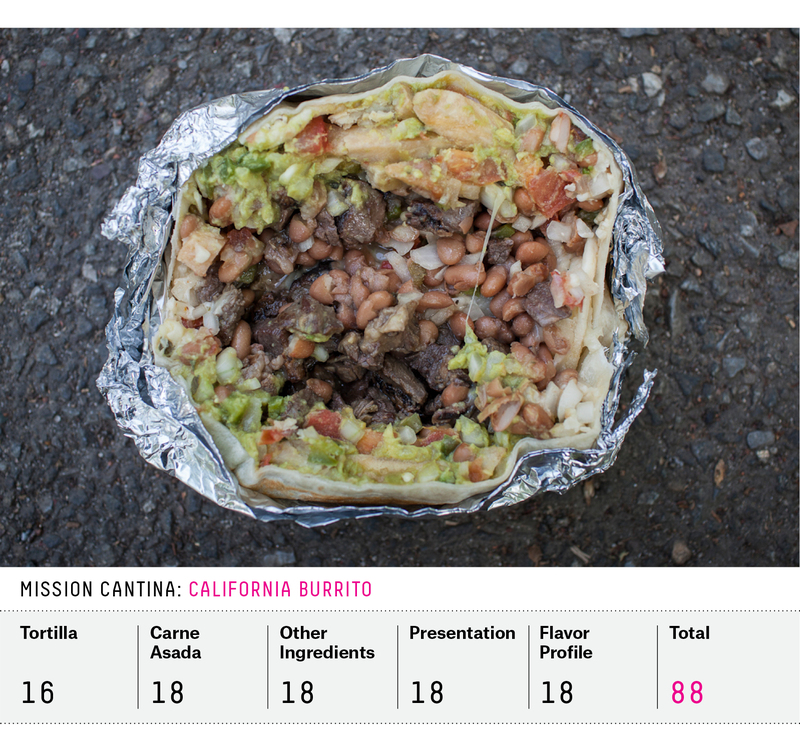 This was a delicious, classic carne asada burrito with just the right amount of flair to make it stand out in a crowd. On a Tuesday at noon, a long line of patrons waited for burritos, but I was the only one using any of the 20 or so seats when I first arrived. A steady lunch crowd filed in and took their meals to go, apparently headed back to their desks to eat. Glass walls opened onto the street and a breeze swung through the restaurant. Every couple of minutes, a worker yelled over the street noise and blaring top 40 hits that they were out of chicken that day. Luckily I was there to eat the brisket. The crowd at Tres Carnes was predominantly male, while the sister restaurant next door, a juice stand, was mostly filled with women. The dichotomy irked me, but the burritos at Tres Carnes are hefty, not a lunchtime meal I’d readily take on under normal circumstances. 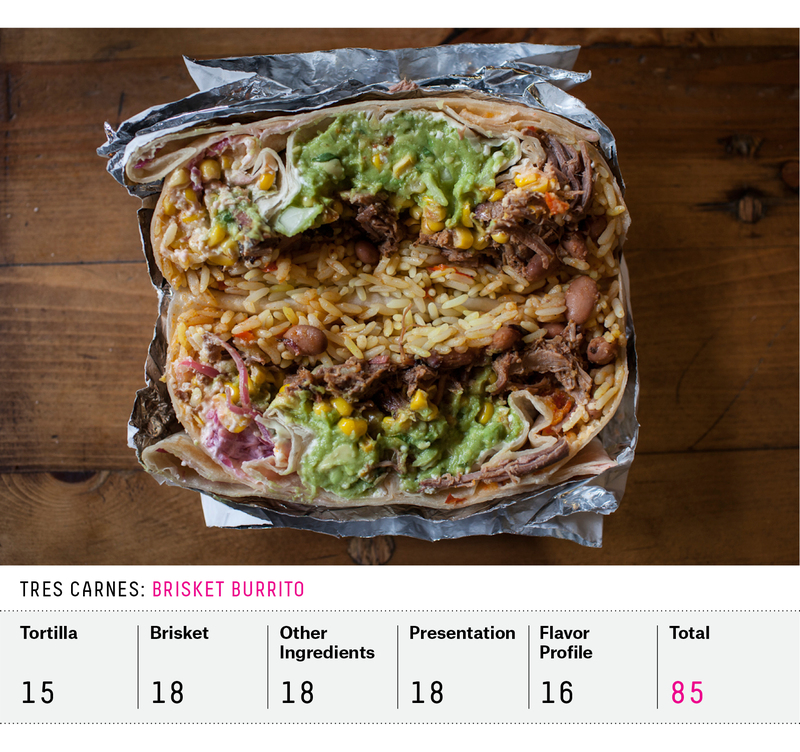 At Tres Carnes, the burrito comes with a meat, yellow or green rice (I chose yellow), pinto or black beans (pinto), a choice of free toppings (I got salsa, crema, pickled onions and cotija cheese) and add-on fillings (roasted corn and “smashed & smoky guac” for me). The Texas-style brisket was deeply smoky, fatty and rich. The pickled onions were bright pink, acidic and tart. The guacamole was good when I got a bite, and the corn was fresh and blossomed with flavor. The Tres Fuegos salsa was rated “XXXX Hot” according to the menu; it wasn’t going to surpass 1 million on the Scoville Scale, but it definitely packed serious punch. Meanwhile the crema and salty cotija cheese, crumbly and simple, rounded it all out. The ingredients were packed tight, making for a dense and flavor-filled bundle of joy. 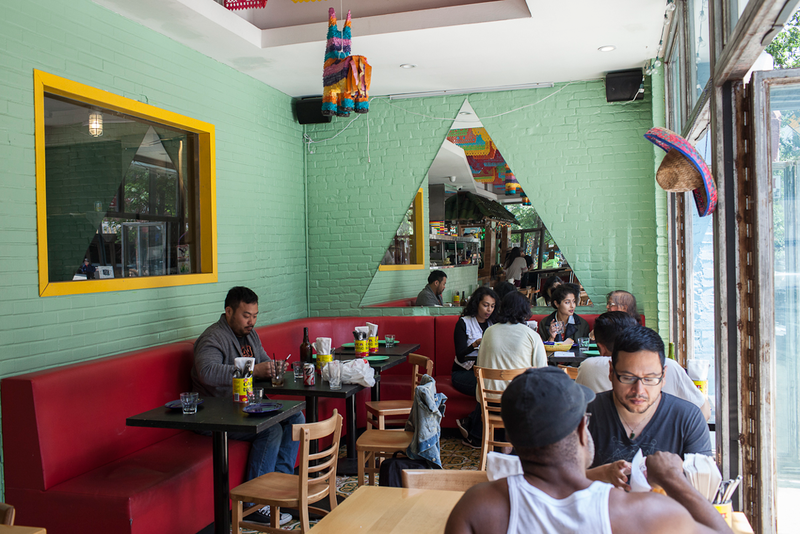 Taqueria Tlaxcalli has already been reviewed by the Michelin Guide, as well as food critic Pete Wells of The New York Times. It was clear that it serves good food, but people tend to go for the tacos, not the burritos. 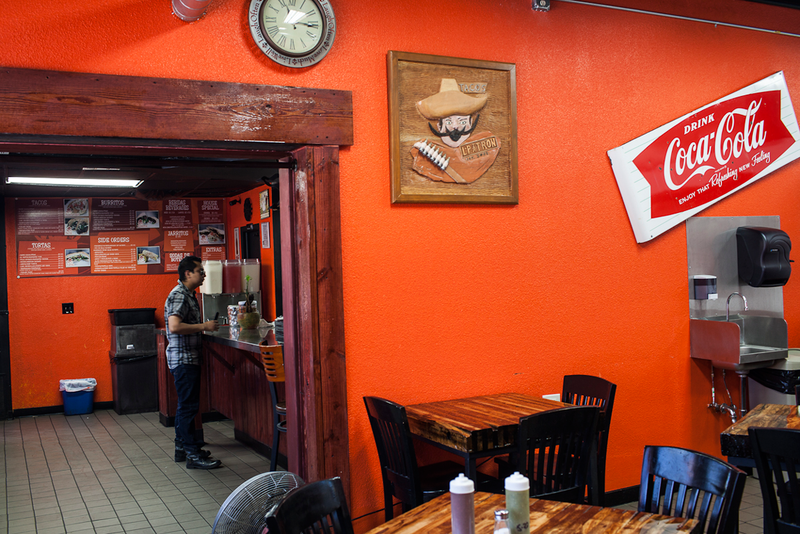 What’s more, the owner is from Mexico City, a metropolis not known for its love of burritos. Tlaxcalli is located in a diverse section of the Bronx, near one of the last stops on the No. 6 train. It’s nestled on a block with a storefront Iglesia Evangelica, a Bangladeshi Halal meat market, a salon and a fish stand. Walking by, you’d never guess the delights that await you inside. House-made tortilla chips came first, and were thick with a dusting of large salt crystals. The salsa was made of tomato, cilantro and jalapeño pureed into a pulpy juice-like consistency with a hint of heat. Chunky, freshly prepared guacamole came served in a molcajete, a porous black stone mortar and pestle that was used in Mexico long before the Spanish descended on that land. I ordered a carne asada burrito, and another with chorizo. The latter meat is a personal favorite and hasn’t yet been featured on the bracket. Tlaxcalli’s chorizo was absolutely delicious, but the carne asada was the showstopper. Four brightly colored sauces crisscrossed the top of the burrito, creating a beautiful Jackson Pollock-like art piece, as well as a symphony of flavors. An earthy, purple, spicy black bean sauce, a blended green avocado, a spicy red chipotle and a thick white sour cream, all delicious individually, achieved a rare and powerful depth when combined. Inside were melt-in-your mouth tender steak, bits of lettuce, orange rice with small pieces of carrot and peas, shredded cheese and black beans. The magic of this burrito was how the ingredients, all great soloists, came together in perfect harmony. 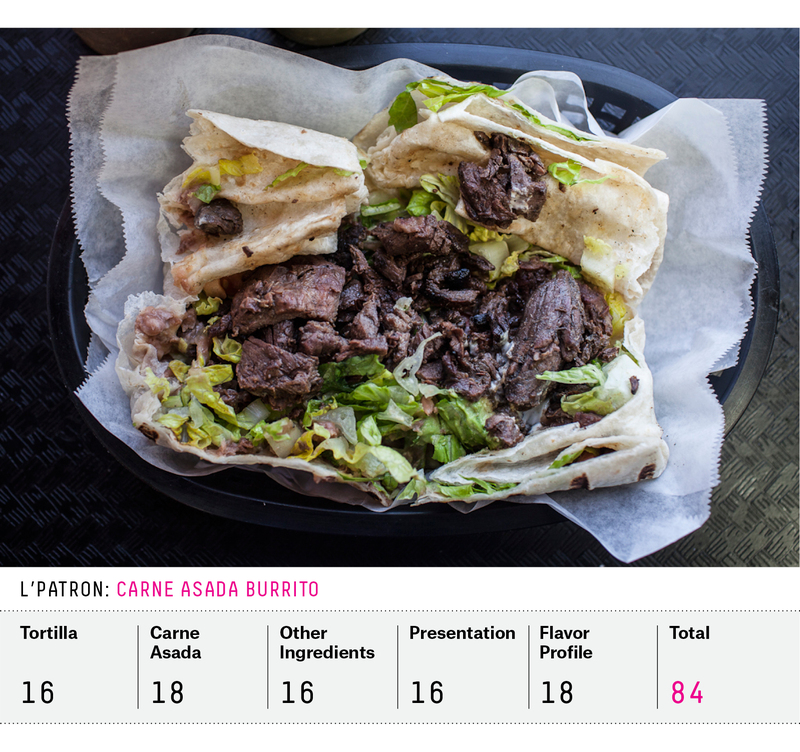 As I mentioned above, before I go to each restaurant in the Burrito Bracket, I do research. I read professional critics, reviews on sites such as Yelp and Menu Pages, blogs and any other sources I can find. So before I went to Mission Cantina, I knew that the burritos kept odd hours. At first they were available only for delivery. Then they were offered in-house at lunchtime. I could have sworn I’d read that they’d become available for dinner, but upon arrival was informed that no, the restaurant did not serve burritos at dinner, they could only be ordered for take-out or delivery. As people filled in at the tables around us, every group looked at the menu and waved the server over to inquire where the burritos were. Every single group. Apparently the word is out about the deliciousness of the burritos at Mission Cantina, but not their availability. So we ordered a selection of tacos and appetizers to stay, and two burritos to go. There was no indication of the public’s favorite burrito, so I ordered lamb and carnitas, saving California-style for the next afternoon. The lamb was like a rich merguez sausage; it had some of the spice of a chorizo, but totally overwhelmed the burrito in mediterranean flair. The carnitas were boldly flavorful, with a hint of citrus that the cook told me was orange peel. I went back the next day with David Chang, chef extraordinaire, Burrito Selection Committee member, and friend of Mission Cantina owner Danny Bowien.2 Amid conversations about the food scene in New York (Chang thinks the cheap and mid-priced eats are the most exciting thing going on right now) and what I’d eaten so far on the burrito trail, we ate our way through our California burritos. A traditional California burrito includes carne asada, avocado, cheese, salsa and french fries (don’t knock it ’til you try it). Bowien’s version features pinto beans, chunky guacamole, rustic salsa, charred beef, lettuce, onion and, of course, crisp french fries. 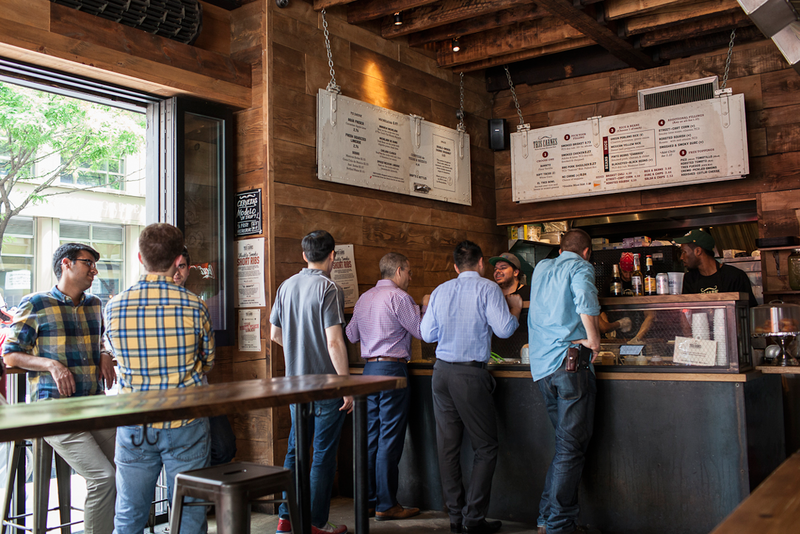 The Mission Cantina California burrito is much more uptight than its San Diego surfer cousins, but what it lacks in beach vibes it makes up for in sophistication. The California-style was my personal favorite for the combination of textures and flavors, and is what’s rated below. But for what it’s worth, my dinner companions were divided between the carnitas and the lamb; I feel pretty confident you can’t go wrong. For $12.50, this is a pricy burrito but an inexpensive masterpiece, prepared with high-end culinary techniques and incredible attention to detail. In the dozen years I lived in New York City, I never once had a decent burrito. The most important thing I learned on this trip was that the Big Apple has come a long way on burritos since I left a few years ago. 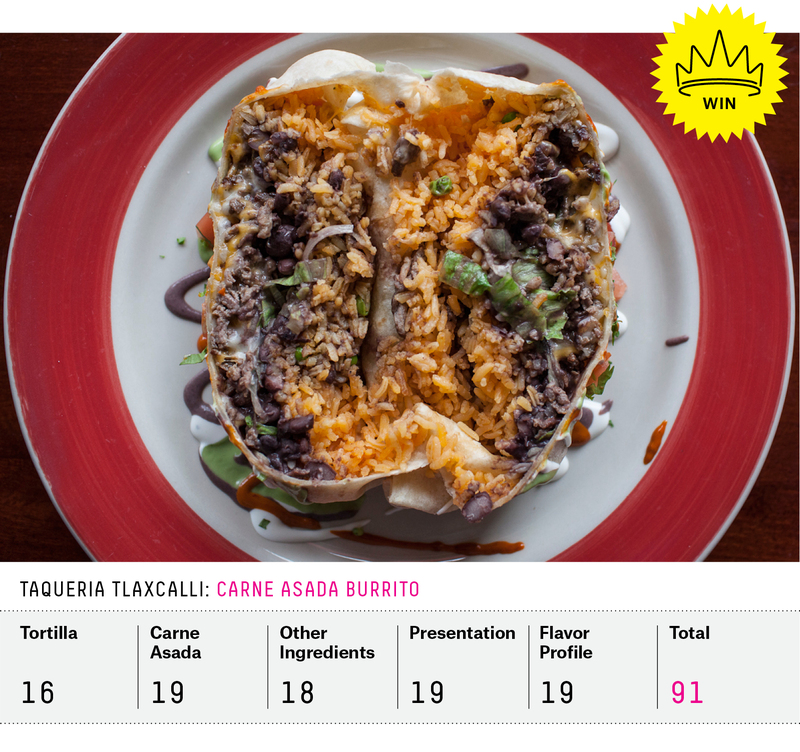 While I enjoyed all three New York burritos (and the one in Chicago, for that matter), the masterful combination of flavors at Taqueria Tlaxcalli sprang through as the winner. While the tortillas don’t always last until morning, I have learned that the best burritos also make great leftovers. Disclosure: We were treated to a plate of pickles and chips and salsa, but we paid for the rest of the meal.